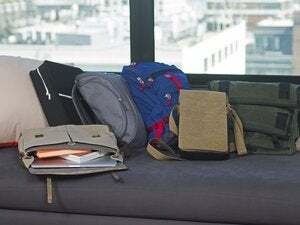 When it comes to having a laptop backpack that provides loads of room for more than just a laptop—books, accessories, peripherals, and cables—Booq’s $135 Mamba Pack has a lot to offer. This roomy and colorful backpack features a dedicated laptop compartment that can accommodate 13- to 17-inch laptops, an expandable compartment large enough to hold a four-slice toaster, various mesh pockets for discs and gewgaws, a removable accessories pouch for cables, and a couple side zipper pockets that can hold a water bottle, business cards, and a couple iPods and iPhones. 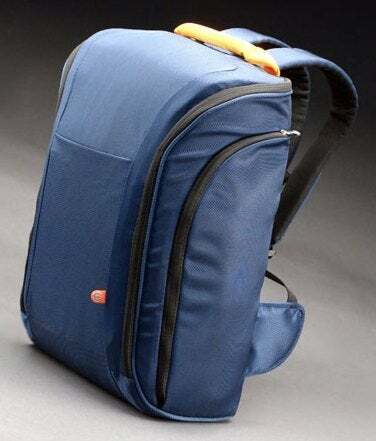 Made of water-resistant polyester, the backpack includes the expected padded back (the area that sits against your backbone) as well as padded straps. (It rides up high enough that a belt strap is unnecessary.) And that padding makes it comfortable to wear. Less expected is the padding on the outer sections of the pack. I’ve been known to place delicate items in my backpacks’ outer pockets so having this extra bit of protection is welcome. That said, the padding gives the Mamba Pack a distinctive shape—no one will mistake this pack for something you’d use for a long stroll in the mountains. This look, of course, is purely a matter of taste. I prefer backpacks that look like the day-packs of old, but you may have a more modern outlook. Your sensibilities may also be thrown by the pack’s bright interior. The navy blue Mamba Pack in my possession has an orange interior vibrant enough to fry eggs. At first I was put off by it, but then it dawned on me that the bright interior makes it easier for me to find items in the bag. Nearly all my other laptop backpacks have black interiors, which make it difficult to find darkly colored items in under-lit environments. Each Mamba Pack has a unique ID number inscribed on a metal plate stuck to the inside of the bag. You use that number to register your backpack with Booq’s Terralinq service. Should you lose the bag, an honest citizen can report its whereabouts to Terralinq and help you recover it. Booq’s Mamba Pack certainly fits the bill in regard to capacity, organization, and comfort. And the extra padding on the outside and the hope of tracking a lost pack are welcome bonuses. If you also like its look, the Mamba Pack could be a good choice.